In honor of the 125th Anniversary of Chesterton High School, the families of Mox Ruge and Mike Harris have made donations to enable the building of three display cases inside Entrance# 31 at Chesterton High School, 2125 S.11th Street in Chesterton. Mox Ruge was the school attorney from 1935-67, while Mike Harris served as school attorney from 1964-2015, a timespan of eighty years. In tribute to their dedication to the School Corporation, its Boards, Administration and patrons, these display cases will help provide a historical timeline for the 125 year existence of Chesterton High School. The high school is partnering with the Westchester Township History Museum to provide displays that will highlight various time periods in the history of CHS. The dedication ceremony will take place Thursday night at 6:30p.m. inside entrance 31, one half hour before the start of the Steinway Dedication Concert. 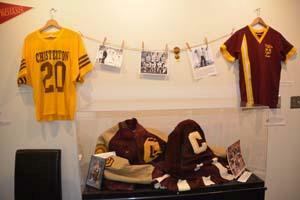 As Chesterton High School celebrates the 125th anniversary of its first graduating class, the Westchester Township History Museum is requesting donations of CHS memorabilia, ephemera, photographs, and artifacts. The donations will be preserved with care and will be used for exhibition at both the museum and high school. The main goal is to fill new display cases at CHS with artifacts, information and images that celebrate the history of the school. The new display cases, being built by CHS Teacher Jeff Larson and his building trades classes, will line the wall inside Entrance 31 near the Auditorium, and will help connect the 15-year old Chesterton High School building to its previous 110 years. The plan is to have the display cases completed and the display fully operational by the Oct. 2-3 homecoming weekend of the 2015-2016 school year. The artifacts will also be featured in the museum’s collection and exhibits. Donations must be brought to the Westchester Township History Museum, 700 W. Porter Ave., Chesterton, during operating hours Wednesday-Sunday from 1:00-5:00 p.m. A Deed of Gift must be signed by the owner and filed with the museum. The museum reserves the right to decline donations that are in poor condition, duplicates of items already owned by the museum, or too large to properly store at the museum. 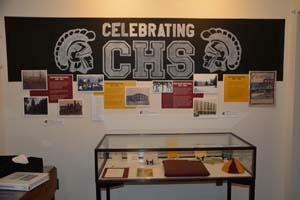 Anyone with questions regarding the donation of CHS artifacts please contact the museum at 219-983-9715. Photo: Chesterton High School 125th Anniversary committee members Dr. Dan Keilman and Serena Sutliff, curator of the Westchester Township History Museum, gathered with teacher David Owen and committee members Principal Jeff Van Drie, Monica Conrad and Jim Ton to discuss the location of the CHS Memorabilia Display Cases. Chesterton High School will celebrate the 125th anniversary of the first graduating class of the school throughout the upcoming months, according to Jeff Van Drie, principal at Chesterton High School. In 1890, two students, Hanna Whitcomb and May Wilber, were the first graduates of Chesterton High School. Now, in the 124 years following, over 12,000 individuals have graduated from the school. “It is fitting that we mark the celebration of this year’s graduating class at Chesterton High School by celebrating a legacy of quality education in our community,” added Van Drie. “All of the members of the committee are excited to plan the events celebrating this unique milestone,” stated Ralph Ayres, Duneland School Board president and a graduate of Chesterton High School. The planning committee will incorporate the creation of a logo designed by a CHS student that will include the legacy of education at Chesterton High School, Liberty Township High School and Jackson Township High School. Liberty and Jackson Schools were merged with Westchester Township and portions of Pine Township to create the Duneland School in 1968. For more information on the history of Chesterton High School click on the links to the left. Van Drie stated that there will be numerous events and activities announced as the committee finalizes each portion of the celebration. The graduation of the Class of 2015 is scheduled for June 4, 2015.